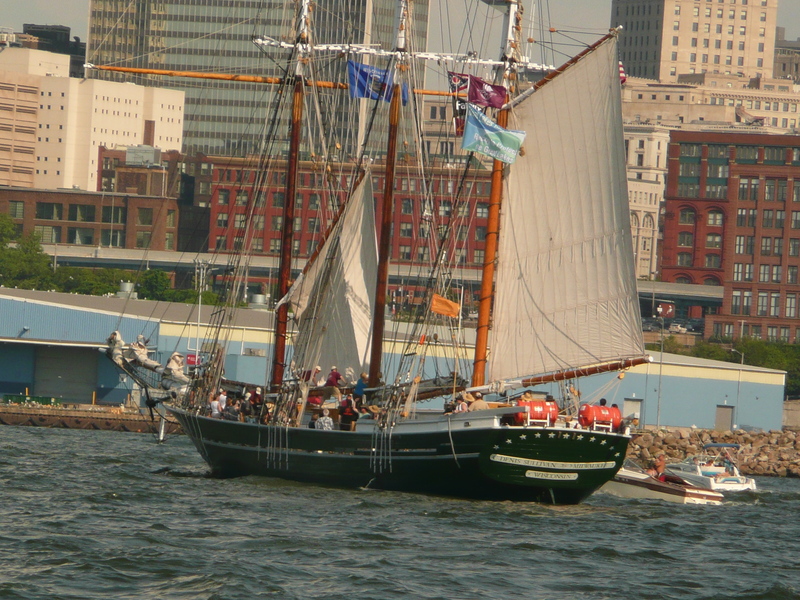 The Tall Ships were in Cleveland this week. They really are spectacular! 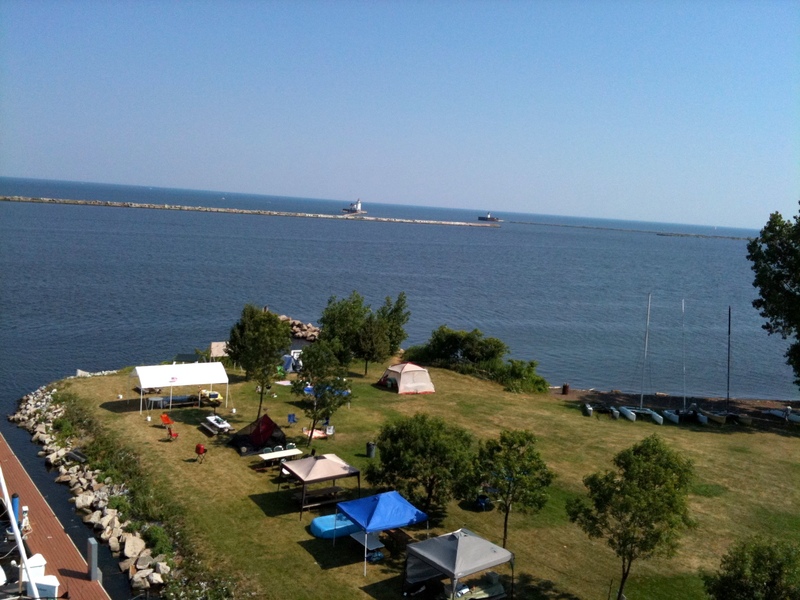 They arrived on Wednesday & were gathered at the mouth of the Cuyahoga River thru Sunday. 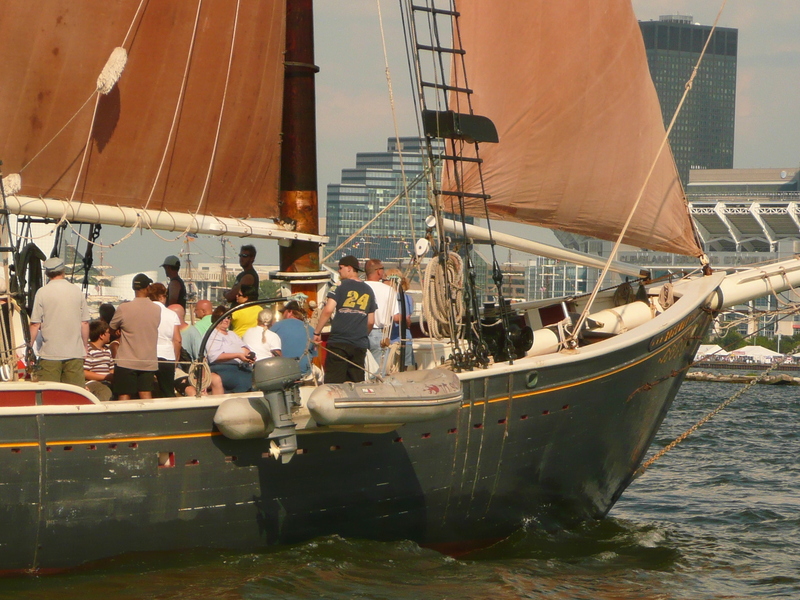 The public could board the boats, and short trips continuously kept the ships moving. Rather than joining the throngs for a chance to be jostled onboard, hurried off, and otherwise treated like cattle, we elected to view the ships from the comfort of our own little ship. 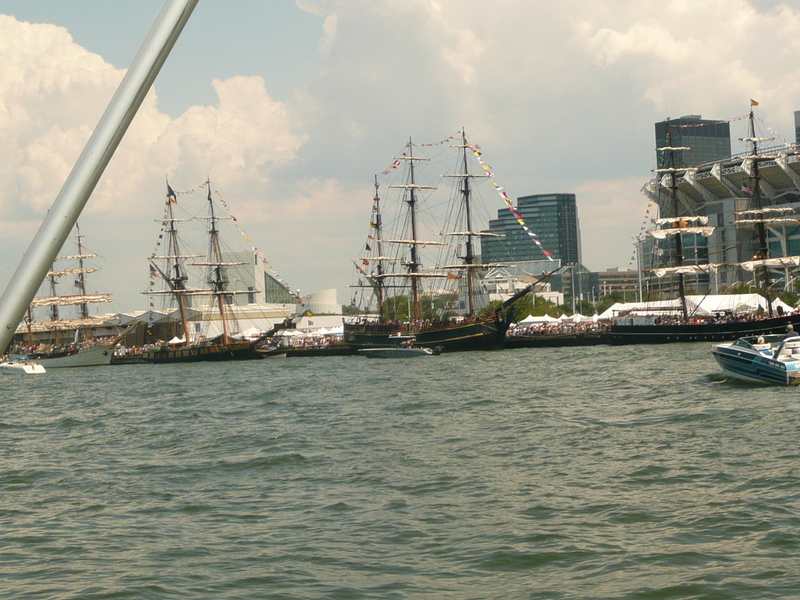 We motor-sailed by, as near as I dared (I manned the helm, Geo manning the camera). The powerboaters, jet-skiers, & other slow sailboats caused quite a bit of traffic conjestion behind the breakwall as we all vied for space to move safely and take photo ops at the same time. I managed not to ram or be rammed & Geo got some nice shots! We continued East to the end of the breakwall, then proceeded up as far as Bratenal before heading out & retuning to the marina. 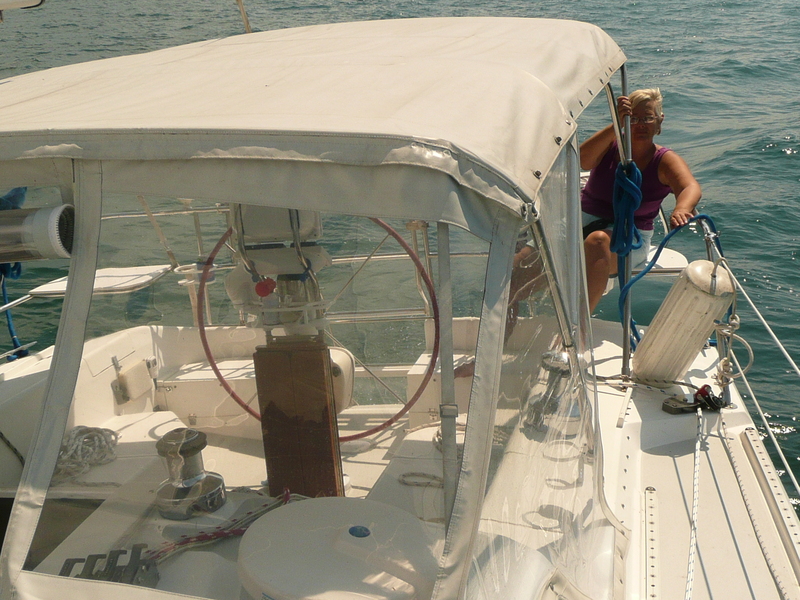 Of course, we lost the wind & had to motorsail the last mile or so back in. 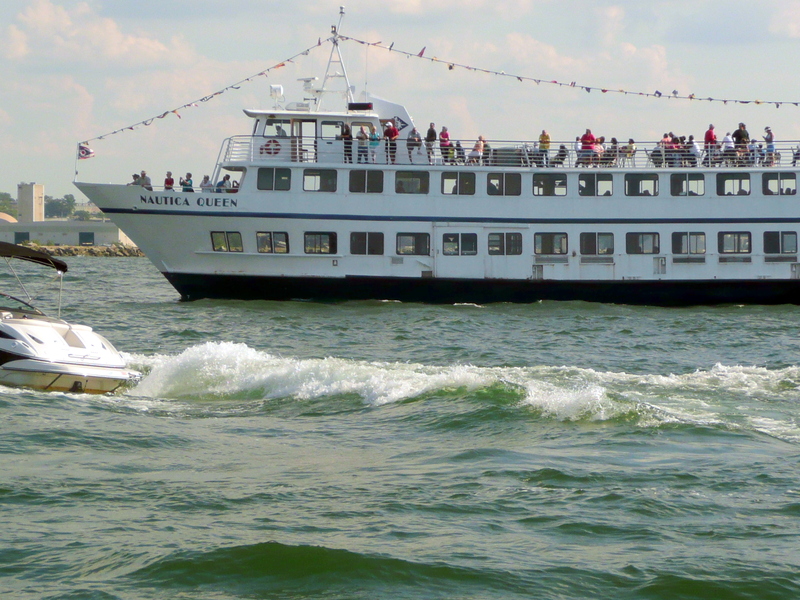 As we approached the mouth of the river & the opening in the breakwall to return to the marina, we joined a returning ship, followed closely by the ‘Nautica Queen’ tour boat, as well as a swarm of other boaters coming into the same bottleneck. 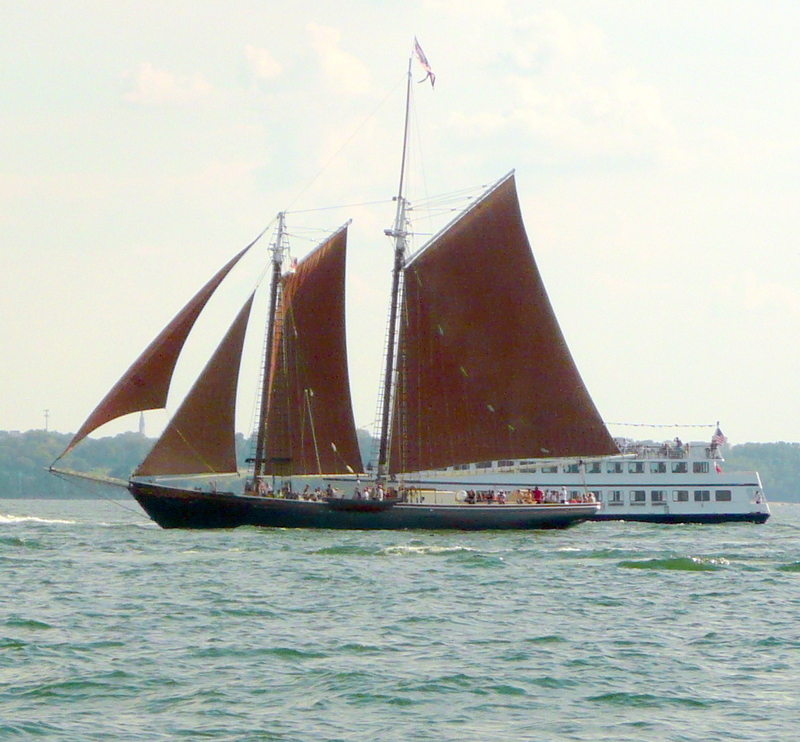 We slipped in between the Roseway & the Nautica Queen so George could get some shots. 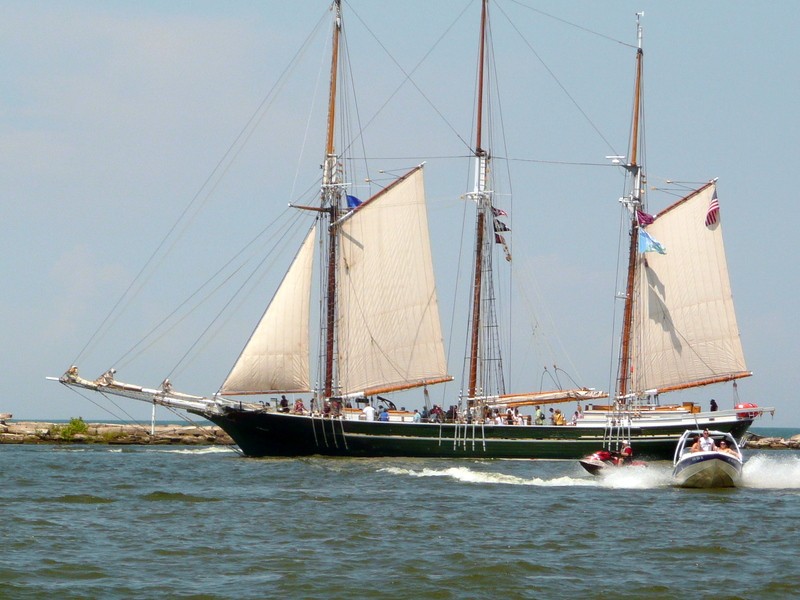 This was as close as we got, & I headed us starboard towards our Whiskey Island Marina – George grumbling, and me relieved to be away from all the traffic. 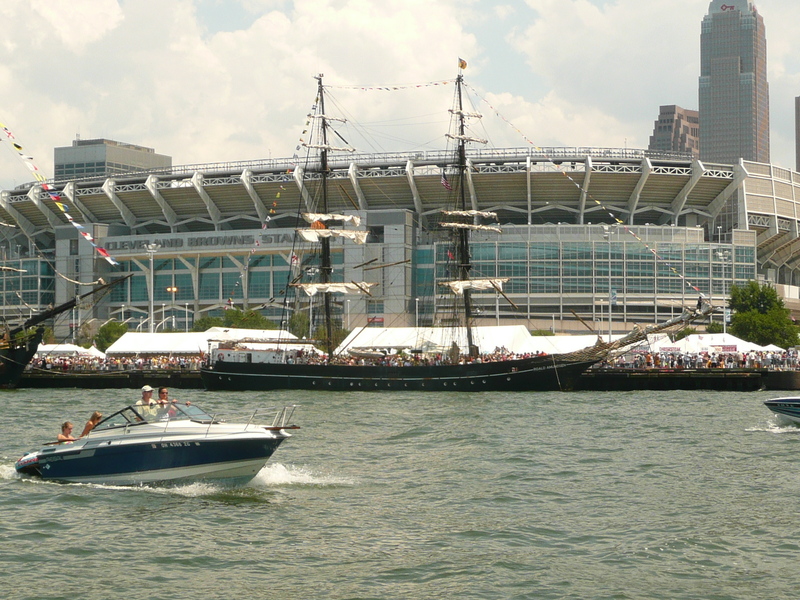 If you’re not familiar with being out boating…just think about being in the parking lot of a Mall at Christmas time. Then think of how it would seem if there were no yellow lines to give traffic some semblance of order. Just everyone traveling any way they wished at any time…Motorscooters, muscle cars, sedans all at once. That’s kind of how it feels. Molly joined us in the cockpit for the last part of the voyage. We didn’t bring Lucy up tho…we’ll wait til we have less boat traffic for everyone to deal with. Another lovely weekend…it’s so hard to go back to dirt dwelling. I love my home on the water. Adieu Outrageous…til next Friday!! 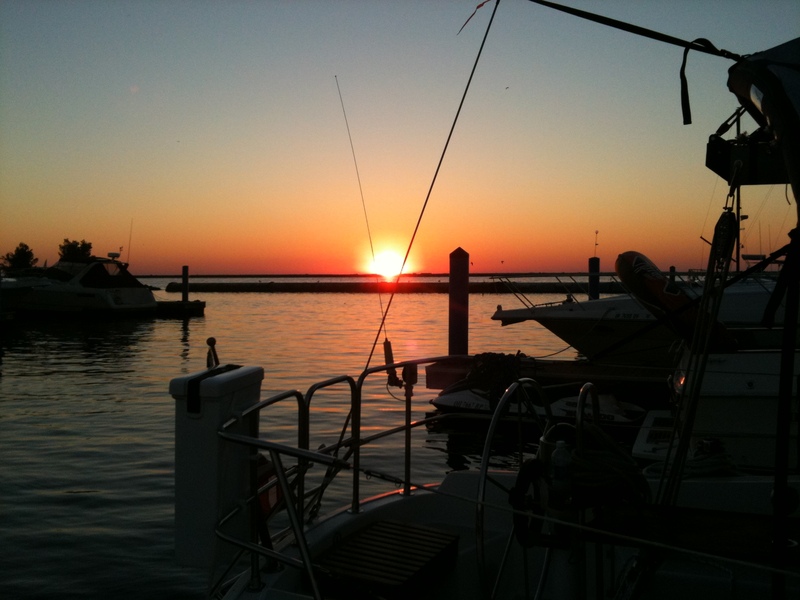 We had a perfectly glorious weekend…no rain, light winds, very warm. On Sunday, I made my 1st trip up the mast. Our wind-speed indicator had been damaged. 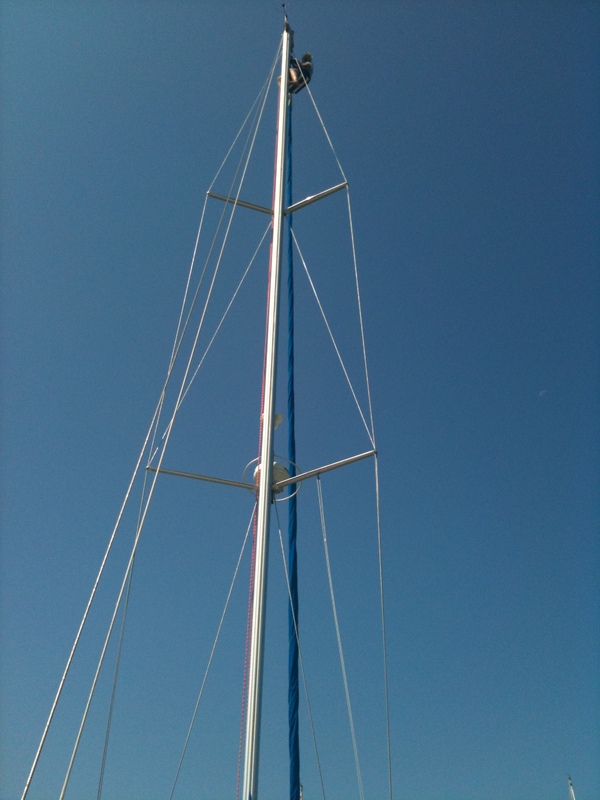 It had been retrieved by the fella who went up the mast to fix a problem with the mainsail lines. 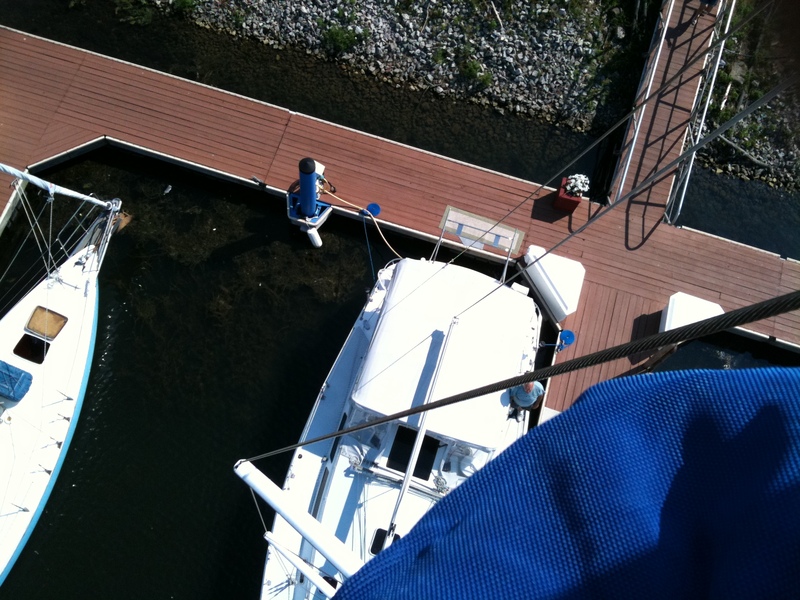 So when it was time to re-install, it was me who got to go up the mast (all 56′ of it) in the bo’sun’s chair. It was VERY COOL!! Guess I’m not afraid of heights, as it didn’t phase me a bit…I just enjoyed the view. The bo’sun’s chair is very comfortable & safe feeling. And my trust in Geo is implicit. Then, we had neighbors for the weekend. A very nice couple from Sweden who were traveling thru spent Friday thru Monday in the slip next to ours. They’re the 1st real cruisers we have met (apart from the throngs of cruisers & cruiser wannabe’s we see at the Annapolis Boat Show each fall). Seems they have spent the past 19 years cruising the Med during the season. 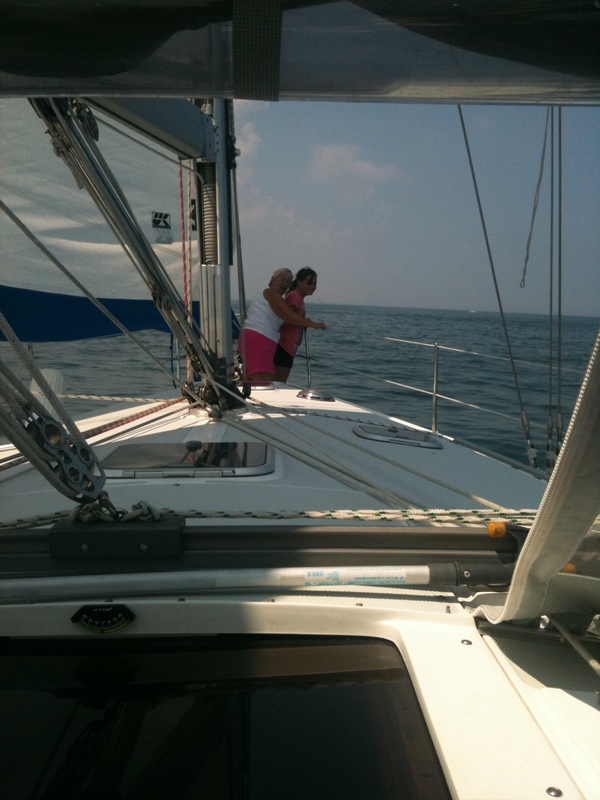 A year ago they had their sailboat shipped to the US & spent last summer cruising the Chesapeake Bay area. 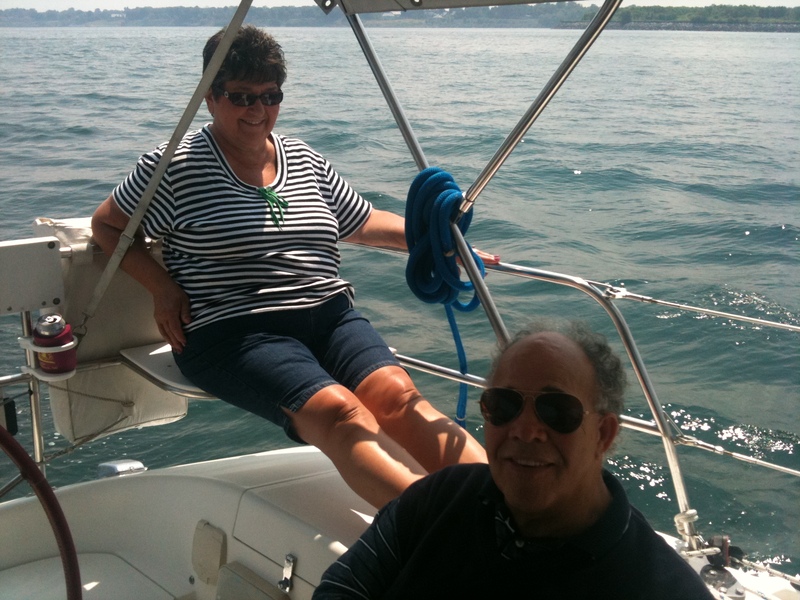 This year they returned, came up the canal system to Tonawanda, and are spending this summer cruising around Lake Erie. Kurt & Monica have a 1964 33′ sailboat. It has a tiller, small cockpit with glass windshield & hard bimini. They have sailed all their lives. The 1st thing they did after getting settled in was to wash clothes. Their lifelines were a-bloom with freshly laundered items, neatly strung with clothespins. Kurt was totally in love with the Gyros the club was selling on Saturday…went up 3 times!! Pete & Elizabeth had them for picnic dinner on Sunday & Pete took them to the grocer’s to provision. They enjoyed the fireworks with the crowds & left Monday around noon. They said they planned on maybe going 20 miles or so. We suggested they stop in Avon at Spitzer Marina. We wish them well on their great journey!! The other 1st for the weekend was on Monday (so not technically the weekend, but who’s counting?) Our friends MJ & Doug P. brought their friend Charlotte & her granddaughter Mackenzie down to have a boat ride. 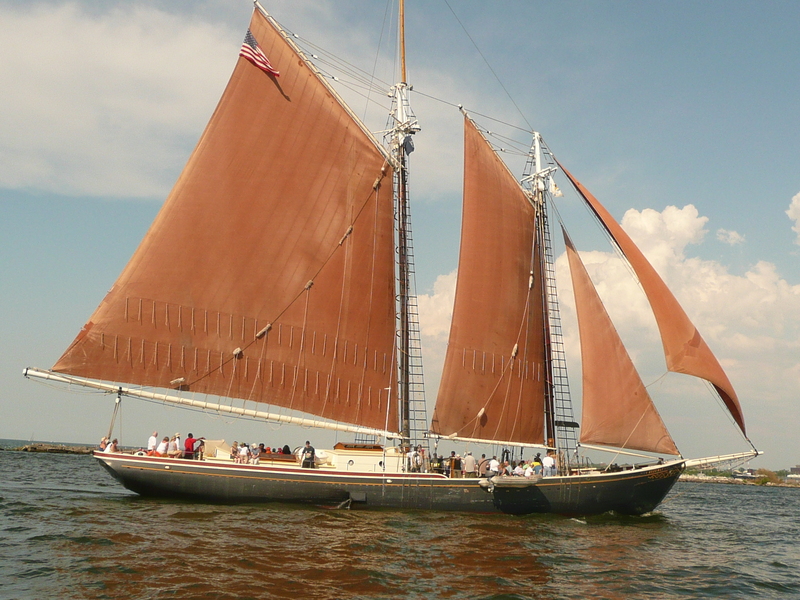 This was Mackenzie’s 1s sailboat ride….as an almost 12 year old, she loved sitting at the bow, watching the water & looking for ‘Stuff’…like dead fish. MJ hadn’t been in a ‘big’ sailboat before. (Although she a seasoned cruise ship traveler.) I believe her previous experience may have been in a 15′ Sunfish, which promptly turned over. She was full of trepidation, but she toughed it out. There really wasn’t much wind to speak of, so we motored down behind the breakwall to it’s Eastern end. By then Geo had raised the mainsail. He then added the jib. Both filled just enough to add a little ‘oomph’ to the motor & we headed out into the open water. 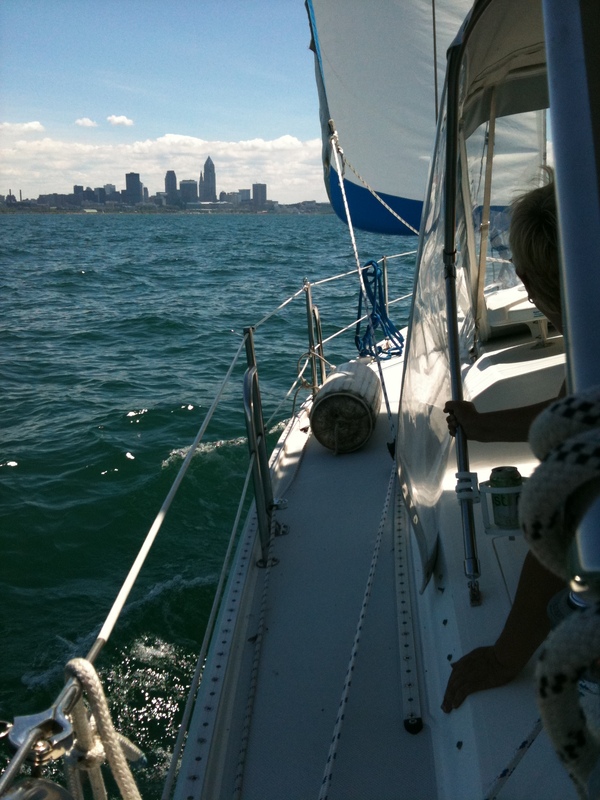 The water was just barely rippling, and at under 5 knots we ghosted along. It gave MJ more a sense of security & by the time we got back to the marina she was sitting in one of the stern rail seats. I think she had a good time,a nd I know her friend & her friends granddaughter will have a nice memory to take home with them. Oh…Doug? He’s so laid back…he just enjoys it all!!! 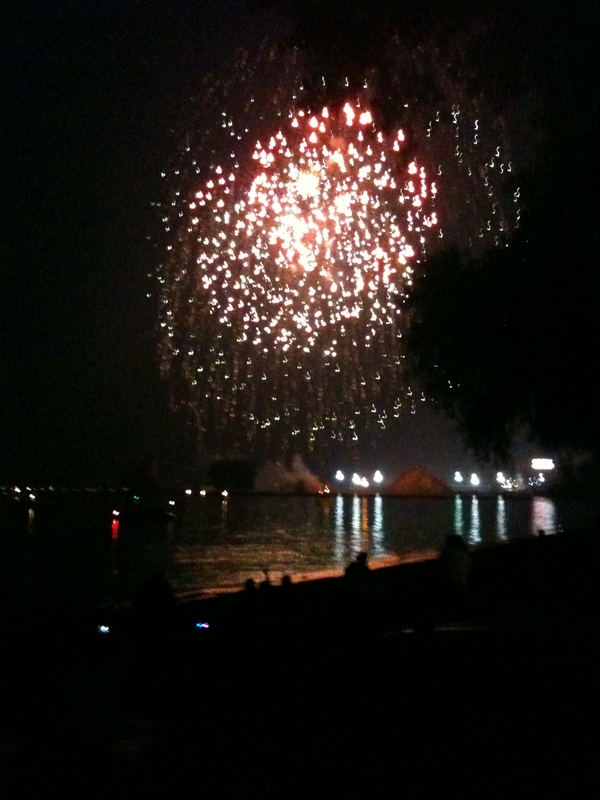 And, of course, we spent the evening watching the fireworks from Whisky Island beach….from there, the view is spectacular..so close you can almost reach up & touch them. When Will It Ever Quit Raining? 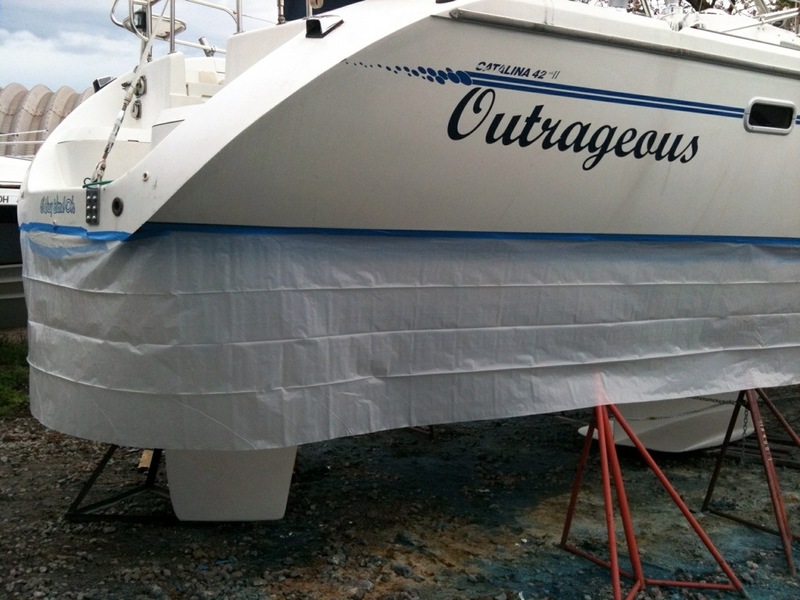 We’ve been waiting interminably for this rainy, cold, miserable weather to let up long enough to finish the hull painting so we can get Outrageous back in the water. We were able to work last Sunday, and completed the bottom painting. 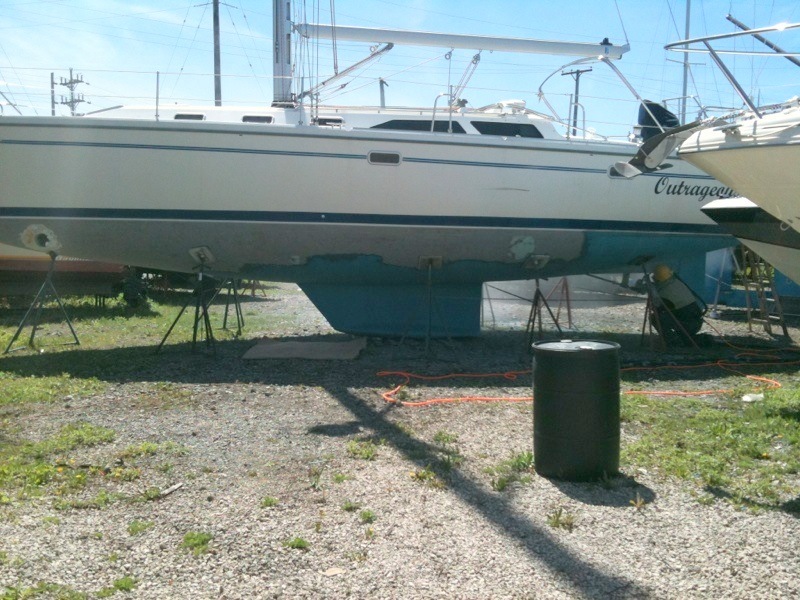 Next was cleaning, waxing & polishing the sides of the boat. We were able to complete 1 side. Then, rain until Wednesday. George worked, completing maybe 40% of the other side, and worked on the stern, which needed some sanding & refinishing. Expensive masking tape is worth the cost!! Today is beautiful, sunny, and warm. 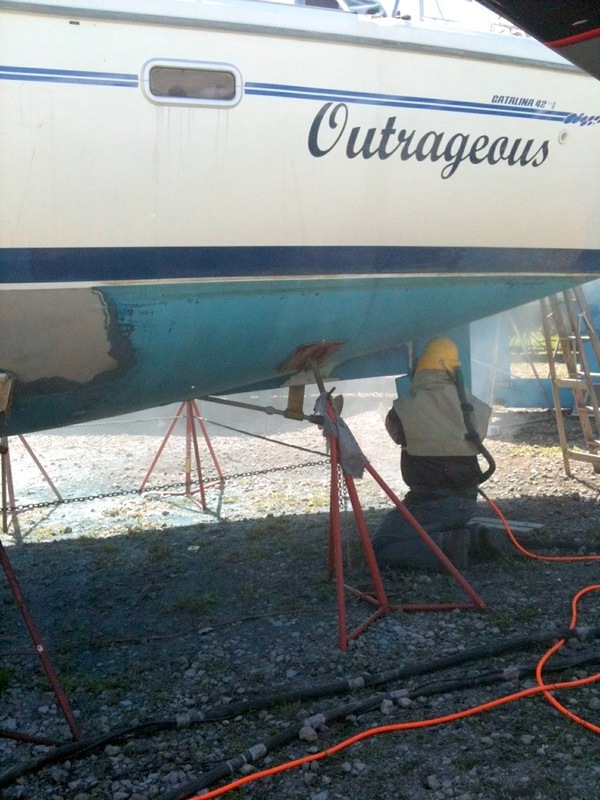 So he’s back at the marina again, trying to get it finished up for launching, perhaps this weekend. So much for Spring in NE Ohio!! ARRRGGHHHHH!! And So We Start Spring Commissioning! That statement comes via a text message from George. Along with pictures of his progress on the bottom painting. We had the hull soda blasted last week..the paint was blistering in a few areas, and was very thick…measurable, in fact. With the paint removed, it’s now time to paint! As you may know, after taking it down to the bare glass, we need to put on a barrier coat, which is a 2 part epoxy type paint, and then cover that with an ablative bottom paint. At this point, George is doing this solo…someone has to look after the store! How Big You Say This Is? Dawn rose thru the clouds, and although it wasn’t raining, it looked like it could whenever it wanted to. But George decided the forecast wasn’t going to stop him and proceeds to the marina bright & early. As soon as he has the next batch of 2 part epoxy paint mixed together, it begans to sprinkle. Off to the home improvement store for tarps. 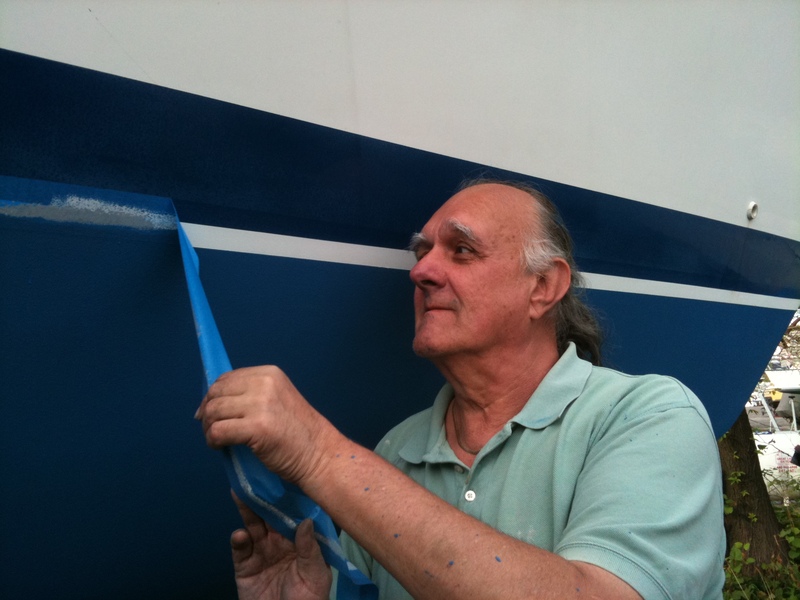 He was able to get 3’x50′ plastic at a very reasonable price & has it quickly taped into place. He’s ready. Now, as I write this several hours later, it’s sunny and almost cloudless. Had he not gotten his tarp, we would have had a storm of epic proportions I’m quite certain!! Tarp ‘Skirt’…in case it rains! You will notice a lack of George’s smiling face in any of the pics, as of course he’s the one taking them. No action shots of him manning the brush or roller. We’ve got a forecast of 90% rain for Saturday, and only a high in the low 50’s for Sunday. So this might be it for painting for a few days. Been doing some little things to make Outrageous more ‘homey’ Got my Singer out & down to the boat so I can do sewing projects on board. Also have found a few things to add or replace. George found this cute metal wall hanging & thought it would look great as a ‘headboard’. I had intended on making a padded headboard, so reading in bed would be nice & ‘pluffy’. But I, too, thought it would be sorta neat – so up it went! I’ve made custom sheets & a custom comforter for the bed. Not hard, just something that needs to be fit & refit a number of times. Theyr’e not perfect yet, but pretty darn nice! I just started with ready-made items & remade them to size. The mast is really not a decorating feature, and so I decided to make a ‘Mast Cozy’ for it. I found a great vinyl that looks like basket weave leather. I made it to have a velcro closure on the back side, and included pockets, as I have no night stand. The pockets hold my Sony eBook Reader, glasses, phone, etc. It also is velcroed from the bottom of the bed platform down to the base of the mast, to hold it in place on the bottom front side. I just love the look of this ..it turned out very nice and blends so well with the walls. The tassel was just a bit of whimsy….cute, eh? I made some curtains for the salon & galley windows. They’re just temporary. Eventually George wants to re-upholster the setee & at that time I’ll do something else. But for now, they soften the room & add a little subtle color. The original accordian style pull-downs are still in place, but the velcro on them has deteriorated & too much trouble to repair for something we don’t even like. On to the bathrooms heads! George installed a proper shower curtain rod. The original was a track into which ran little ‘buttons’ from a specialty item Boat/RV shower curtain. Very flimsy, old, and proprietary. This is a curved shower curtain rod purchased at a local home improvement center. We then merely had to purchase standard rings & curtain, which I cut down to fit. I’d gotten some medium weight denim at a bargain price, so have made a lifevest bag for all the extras we have on hand and sleeves to hold our ‘doors’ when they’re not in use. George wanted a simple way to keep our lines in order. He found small hooks which one puts elastic cord thru, forming a loop. The loop holds the coiled line, hooked onto the hook. This seems to be adequate, and was just a matter of cutting elastic cords to the proper length, tying the ends, and installing the holders. At one time, boats over a certain size were required to have a ‘ship’s bell’. Well, we found one in amongst the ‘stuff’ the previous owners had left. I spent some time polishing it and cleaning the knotted cord. It is no longer required, but we hung it anyway. Certainly a nautical addition! After removing the seat, we were short some seating. We had purchased 2 folding canvas chairs. They are comfortable, but if you want to stretch you legs out, there’s nowhere to really recline with them. George found a reclining folding canvas chair that is GREAT! It’s not only comfortable sitting, it’s extremely comfy to recline – great for TV watching or snoozing a bit! Now, I realize that the color isn’t the greatest, but it was the end of the season & it was the only one available. And when I’m sitting in it, I can’t tell what color it is, anyway! A final, but very important purchase is the fishing net you see just at the lower edge of the bimini. This is not strictly a net for landing your catch, but is now known as a Molly Catcher. 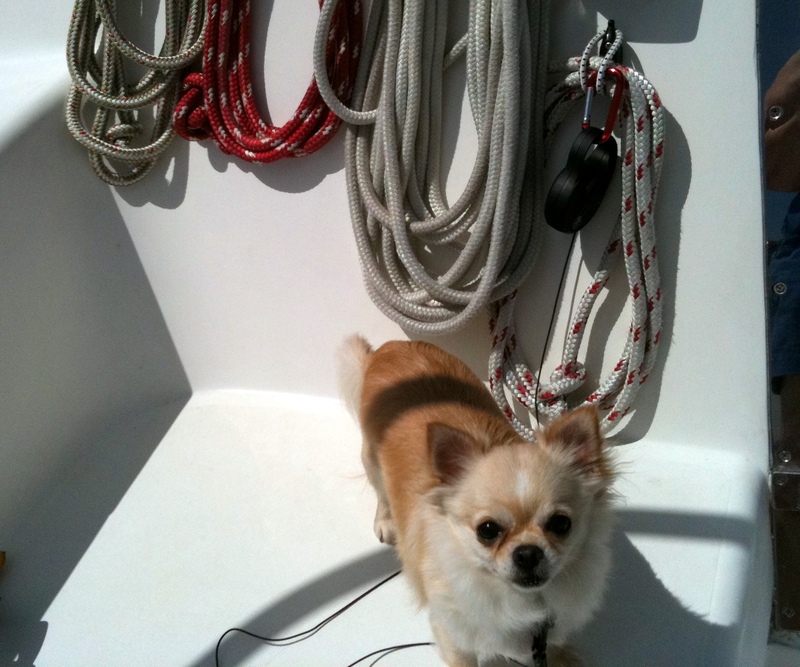 You see, Molly the Boat Dog has become quite comfortable all over the boat, following me as I do chores above & below deck. We were out one nice morning – I, cleaning some windows; she, checking for bugs. I heard a ‘plop’. I turned my head. No Molly. Further exploration revealed a small, wet Chihuahua doing the dog paddle. I ran below to retrieve the net, but by the time I got back, she was no where to be seen. She had swum under the dock next to her, then under the adjacent dock and was swimming between that dock & the shore. Using my trusty Molly Catcher, I scooped her and a clump of seaweed up and safely deposited her on the dock! It was sort of a non-event for her – she ran up on the lawn, shook the water off & rolled a bit, then started running about like nothing had happened. But I sure was glad we had the Molly Catcher!! So, now the Molly Catcher is secured in the cockpit…where it should be! That’s about it for now…we’ve done other things, but have no pics to post & no one like reading just plain text. 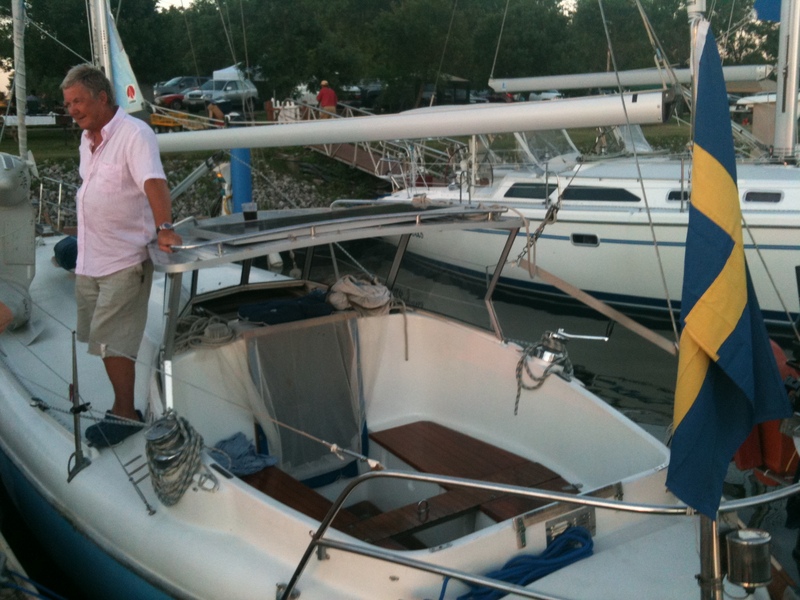 Next installment, , our sailing adventures!! Whew! Summer Just FLEW By! Low & behold…it’s already the end of August! 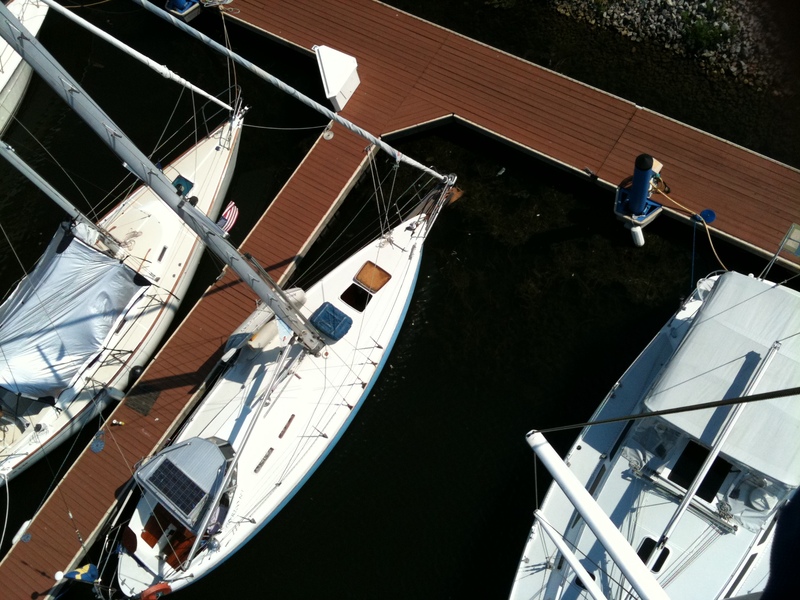 I haven’t posted since June – just enjoying the summer, doing boat projects, sailing (not NEAR enough of that…more later), learning about the boat and it’s little idiosyncrasies, and general hanging out. Where to start? Well, George replaced a number of the hatches. The porthole windows & hatches were badly crazed from the extreme heat & sun of Florida, so 5 hatches were replaced. Here’s a pic of how they all look. 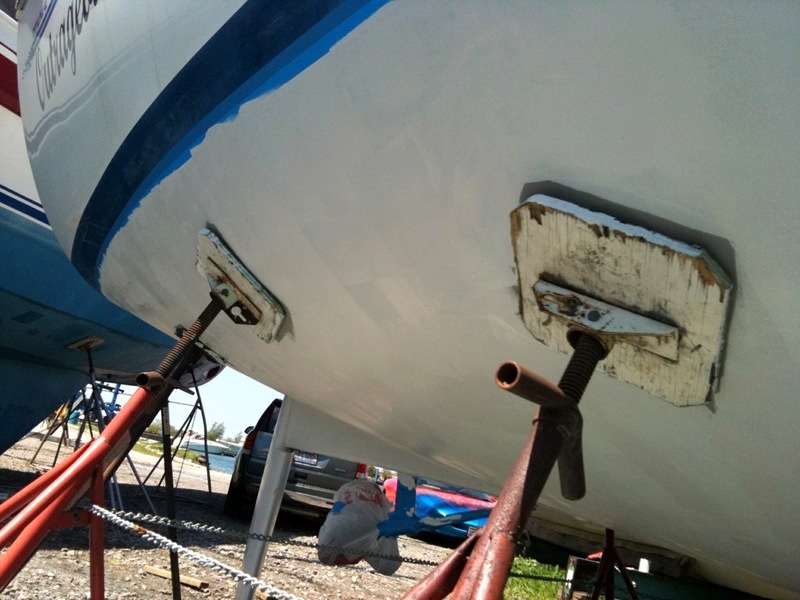 The hatches are now nice & clear – we were concerned with safety if a lot of weight were placed on them. The portholes will just have to wait. We found that the salon table can be set down to a lower position. A custom cushion could be made to convert the space into additional sleeping accomodations. We doubt that ever will be an issue, but it’s nice to know it’s possible. 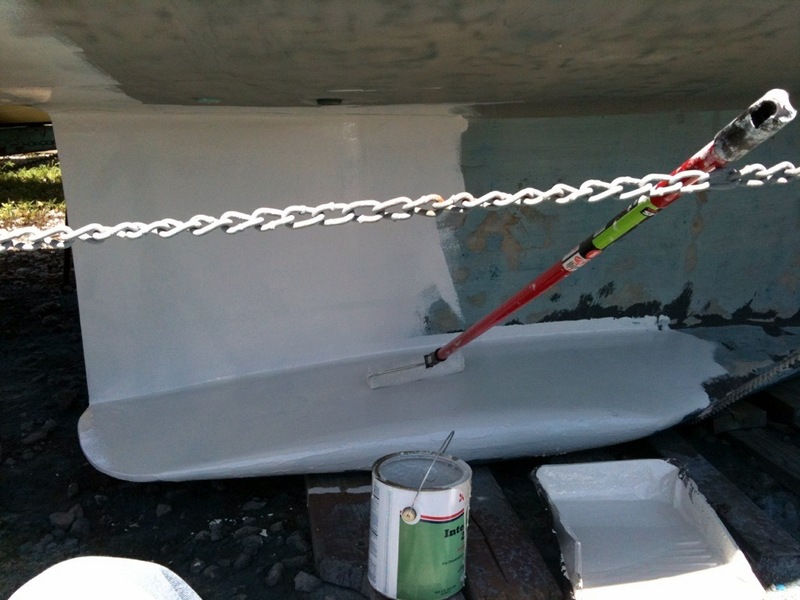 George removed the wood trim around the companionway & refinished it. So now we have nice, freshly finished wookwork, as the finish was quite worn & shabby looking before. We also drained all 4 of our water tanks. We were able to clean 2 of the tanks of the sludge that remained. The other 2 were just so much of a hassle to acess that we didn’t clean them. A connector broke where the water lines all converge, so until that is replaced, we don’t have running water. So I’ve had a crash course in water conservation! It’s amazing how little water I can get by with for cooking, dishwashing, etc. Not even really that big an inconvenience! A few gallon water bottles filled from the dock water line, some bottled water for drinking/cooking & we’re all set for the weekend. I sorta told George that as we have such a small amount of time to enjoy the boat, we should do just that, and leave projects for when it’s colder. So projects have become less of a priority…manana, as they say south of the border! While we’ve been waiting for the bottom to be painted, so we could launch, so we could put up the mast, so we could put up the sails (whew), we’ve been making some changes aboard Outrageous. I came down one day to find the settee removed from the salon! After discussing the pros & cons we decided that it opened the space up so much, and that we would get 2 chairs to replace the seating. Perhaps ‘director’s chairs’ which can be folded away. George also suprised me with a new flat panel TV, which he mounted in the salon. Along with it, a DVD player. He has these installed , along with an HD antenna. While he was at it, he added an iPod connection to the radio mounted in the nav station. So now we can listen to the iPod on the cabin stereo system. It also charges the iPod as when it’s plugged in, so no need to bring a charger. I’ts great! Purchased some transparent storage bins with latching hinges. I’m sure we’ll fill this quickly…when you’re used to a house, condensing your life into something this size will take some getting used to! We had an impromptu cookout yesterday on the lawn adjacent to our slip. 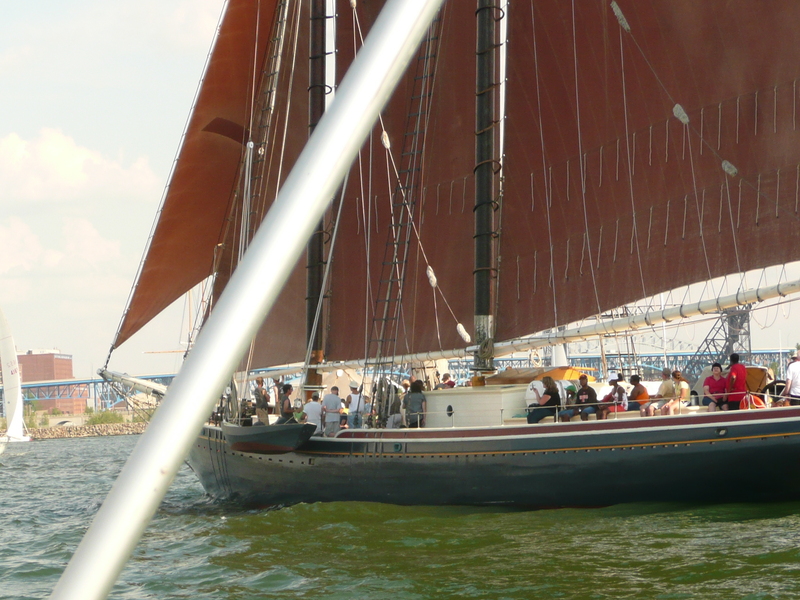 Folks got a 1st look at the boat, and several were pressed into service assisting George install the jib sail. A friend and I sat up on a picnic bench & watched the proceedings – enjoying a day that I wasn’t working, but just doing hostessing duties for a change! So now, it seems, we are ready to sail! Next step is to get some lessons under our belt.